The National Weather Service has issued a flash flood WARNING for Augusta County, Waynesboro, and surrounding areas including Sherando, Afton, Wintergreen, Montebello, and Big Meadows. Overnight downpours and heavy rainfall today may cause runoff and flooding. A home school friend who lives in a home on the slopes of the Blue Ridge Mountains practically within a stone's throw of the Skyline Drive Facebooked me this morning and said they had received two inches of rain overnight on top of the two inches received earlier in the week. With continued moisture, she noted, "Hope we don't slip off the mountain!" Read more about the rain and local reactions at my morning post at the Washington Examiner. One vote was all that allowed Democrats to adjourn Congress to avoid voting to extend the Bush tax cuts which surely would have passed because so many Democrats cross the aisle, according to the Washington Examiner. The final vote was 210-209. Inexcusable. Now Nancy Pelosi and her henchmen will go after the Democrats who broke ranks and voted with the Republicans. After weeks of dry weather, the Shenandoah Valley saw relief Sunday and Monday with a steady rain. Now a tropical depression is moving up the East Coast and will soak the Valley possibly causing flooding to some locations. The National Weather Service has issued a flash flood watch for the entire viewing area from this evening through Thursday evening. 2-4 inches of rainfall is expected with localities seeing 6 or more inches. Hopefully, the rain will help with forest fires in the surrounding national forests. Update: A more indepth version of this is available at the Washington Examiner. Barack Obama will be visiting Richmond this afternoon touting recovery and jobs, stepping into Republican Congressional Whip Eric Cantor's territory. Perhaps the President feels threatened by the Republicans and feels it is urgent to visit Richmond? In that case, I hope Congressman Cantor and all the others keep chipping away at the President's poor choices for America. Bolling's advice to Obama included abandoning portions of the health-care overhaul, including fines and penalties on business owners who do not provide health insurance for all employees. He also suggested relaxing environmental and financial regulations to allow businesses to grow sooner rather than later. "We have to get the federal regulators off the backs of the banks so they can loan the money they already have to the people who need it the most," he said. Finally, Bolling asked that Obama pledge to reduce federal spending by a minimum of 5 percent a year with a goal of trimming back to 2006 levels. "We've done this in Virginia, and it can be done at the federal level as well," he said, adding: "Every business owner and every citizen knows that a $14 trillion national debt is simply unsustainable." Today's Obama event is closed to the public so that makes me wonder if the president really wants to hear from everyday Americans? Or does he just want to make the front page of the newspapers? Early leaf color in western Augusta County. Rode out to western Augusta County today to check out the Marble Valley forest fire and national forest back roads. Some early leaf color is on the mountain slopes, a reminder of what will occur over the next three-to-four weeks. A month from now most trees will be bare of leaves.We met up with some federal forestry people who updated us on the fire ... first hand news was good since I was writing a post for the Washington Examiner. Cooler temps and the smell of the woods and fallen leaves made for a perfect autumn day. There are several other forest fires in the national forests. I don't know which one we can smell at our house but the wood smoke smells like a campground. Paid ideological astroturfing... left wing protest in D.C. this Saturday - Lefty libs are being paid to converge on Washington, DC, this weekend to protest the "anti-Beck" and other conservative rallies. Forest fires in Virginia's Washington and Jefferson national forests - A forest fire continues to burn in a remote mountainous area of western Augusta County. October should be about four months long because there is never enough time for everything! There are so many festivals along with lots of social activities that each weekend ends up with a stack of possible events and invitations. It is often difficult to pick and choose when I would like to participate in them all! Tonight we received an invitation to a friend's party to be held at their family winery. It's the fourth invitation for that day and I'm very disappointed to have to turn it down. Maybe they will remember us next time. Meanwhile, the final days of September are also busy as October creeps closer. The leaves will not be as colorful this year because of dryness but they will still be a sight to see as we dance with the mountains and enjoy being outdoors. 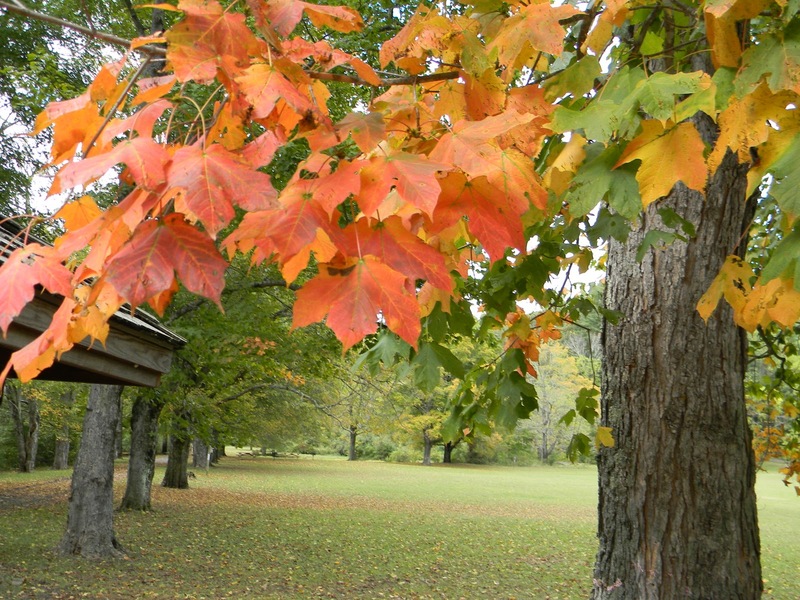 Hiking, camping, cookouts, picnics, time with friends and family ... October will be jam-packed with adventures! In advance of President Obama's "backyard conversation" scheduled for Richmond on Wednesday, Lieutenant Governor Bill Bolling, Virginia's Chief Job Creation officer, will discuss the devastating impact that President Obama's policies have had on small businesses, and what actions Congress could take to get small businesses hiring again immediately. 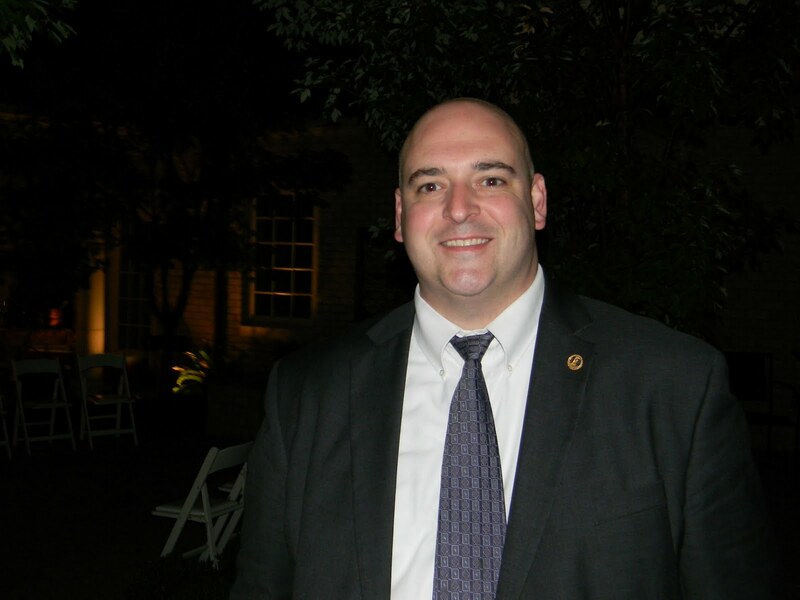 Richard S. "Syd" Chapman, Jr., the vice president of Carroll Plumbing and Heating, will join the Lieutenant Governor to discuss how uncertainty flowing from Democrats in Washington has impacted his business. Joining Chapman will be Debbie Stocks, a health insurance broker for Your Benefits Partner, who sells exclusively to small business, to discuss the impact of ObamaCare on small business job creation. Tuesday, Sept. 28, 11:30 a.m. Parking is available on street, or in a fenced lot immediately behind the building, accessible via alley from N. Davis Avenue or S. Robinson Street. Please be certain to park inside the fenced area, not in any surrounding lots. Mourning in America ... higher debt and unemployment under President Barack Obama. When huge amounts of money are involved, waste is not uncommon ... and Barack Obama's stimulus bill is no exception. Here are listed just eight examples of stimulus funds and common sense parting ways ... my latest at the Washington Examiner. Happy Birthday to SWAC blogger Bob! Happy Birthday to Bob K! This man's life journey has taken him to many places and along many paths making him well-loved by his many friends and colleagues. Bob K is celebrating his birthday today and I'd like to add to his birthday wishes. Bob is a Christian, loving husband, dad to two great kids, and home school veteran parent who looks at the world with artistic eyes and sees what many miss. His love of Christ shines through in everything he does ... his photos are inspiring ... his faith in mankind is restorative ... his friendly smile is well-known. He is a fellow SWAC blogger, educating and opining at his blog, The Journey, as he shares his art and photos and experiences. Friends have been stopping by his Facebook page all day leaving birthday wishes, and he responded by providing an update about how his day had gone so far. It turns out he spent the morning in his wife's preschool class teaching those little folk how to draw a black bear. "To draw a bear, you start with a pear. Put on some legs, and then add some hair." I drew the bears and the kids painted them and added acorns, leaves, grass, etc. I love their joy and energy. That in a short paragraph shows the joy Bob finds with life and how he is always looking to enrich someone else's life or share his love of art in some way with others. His weekly hikes in the surrounding Blue Ridge and Appalachian Mountains are legendary as he brings back photos of changing leaves, snow, animals, rock formations, or anything else that catches his eye. He often invites others to join him as he explores yet another trail on his life's journey. Bob would insist his friends have enriched his life but rest assured we all feel our lives have been enriched by knowing him and his family. Update: Bob posts a response. His name is John Schwarzman ... he's from Reston, Virginia ... and he's a proud American. The video is 3:02 and well worth the listen. 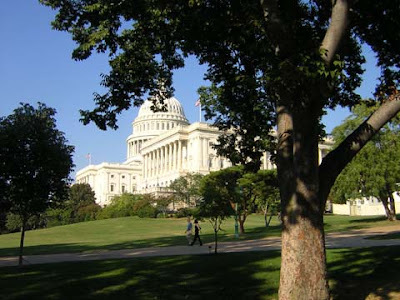 WaExaminer: "Clean air and water aren't Big Green's top priorities"
The Washington Examiner's Editorial Page Editor Mark Tapscott has a "green" series that is worth the read. "In their success, environmentalists have gone too far, destroying the once-healthy balance between economic and environmental needs." "They are, in short, Big Green, the green gorillas of American politics and public policy, allied within the Democratic Party with Big Labor, trial lawyers, college professors, government dependents and abortion-at-any-cost extremists." Five of the 50 volumes containing the federal regulatory code are devoted exclusively to environmental regulation, and an additional 12 volumes address environmental regulation to some degree." "Of the $8.2 billion in annual revenue collected by the country’s 26,000 environmental non-profits, 32 percent of it goes to 285 that are based in the Washington, D.C., area." Are the skies friendlier in Highland than Augusta for the Rocket Boys? For background on the Rocket Boys case, please see the series of articles here. A missed opportunity for education in Augusta County could turn into an eagerly embraced activity in neighboring Highland County. The Valley AeroSpace Team (VAST) may have found a new home in Highland after an anonymous landowner's complaint and the Augusta Board of Zoning ran them out of this area in the summer of 2009. The new location involves a 1 1/2-hour drive over the mountains for most who live in the Augusta County area. Highland offered open arms to the family-friendly science of rocketry, expressing delight at having the dedicated volunteers come to their community to guide youth in a hands-on teaching experience reminiscent of the Rocket Boys in the "October Sky" movie about Homer Hickam who went on to become a NASA scientist. A rocketry club booted out of Augusta County in a hotly contested zoning dispute launched again Friday in a neighboring county to the west. Highland County students screamed with delight, pointed skyward and applauded uproariously during a rocketry demonstration coordinated between the club, officials with the school district and the county economic development office. For the Valley Aerospace Team, or VAST, the rolling land south of Monterey has promise as a new home for their hobby rocket launches. School and county officials embraced the team, increased rocketry-related science lessons in schools and helped pinpoint a good property for launches. Young people in rural areas are in need of entertainment and educational opportunities to prevent drunken partying, vandalism, drugs, gang participation, and other negatives from not having "something to do." VAST offered that opportunity for budding scientists, a safe event for families to enjoy. Augusta County is, in my opinion, short-sighted when it comes to looking into the future. Our youth are our future ... "to teach is to touch the future." What a shame a number of local leaders cannot see that. Tuesday night's Public Square regarding the privatization of the state's ABC stores proved a success. The participants -- attendees as well as panelists -- expressed themselves with civility and conviction. Passion did not lead to confrontation. The newspaper's Public Square series is intended to promote conversation in a congenial atmosphere. We seek engagement. The ABC session met expectations. The Times-Dispatch supports privatization in principle, and has taken that position for many years. Privatization is a concept whose time has arrived. Botetourt GOP Chair Christine Broughton had a successful event tonight at Lord Botetourt High School with 200+ in attendance at the 44th annual ham dinner fundraiser. Driving back to Augusta on I-81 with SWAC Husband and Suzanne, it's still fresh in my mind as I pull from my memory those who spoke and those who attended. at 2009 Virginia Republican Convention. Photo by Tom White of Virginia Right! The guest speaker was Adnan Barqawi, that wonderful young man who was a Virginia Tech cadet and captivated the 2009 Virginia Republican State Convention when he addressed the coliseum full of enthusiastic Republicans. Tonight he did not disappoint. Though it had been 16 months since the convention, and he had traded his cadet uniform for a business suit, his ability to inspire, captivate, and move those in the room had not changed. He electrified those who had not heard him in the past, and brought tears to the eyes of those who had watched his journey since moving to America. More about Adnan as I upload photos in the next few days. The evening was emceed by Adrian Cronauer of "Gooooooooood Morning, Vietnam!" fame. Speakers included Congressman Bob Goodlatte (who attended with Mary Ellen), State Sen. Mark Obenshain, a rep from the Heritage Foundation, State Sen. Ralph Smith, and others. 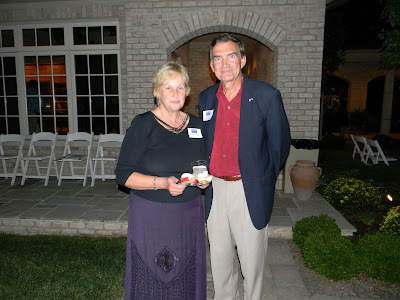 All those in Republican leadership were recognized including Suzanne Curran as "volunteer extraordinaire." There was food, fellowship, music, door prizes, and fun all around. If you wonder why so many American voters are angry, and no longer give Obama the benefit of the doubt on a variety of issues, you need look no further than Obamacare, whose birthday gift to America might just be a GOP congressional majority. November is coming and, to paraphrase an Obama line, it's time for change we can believe in. 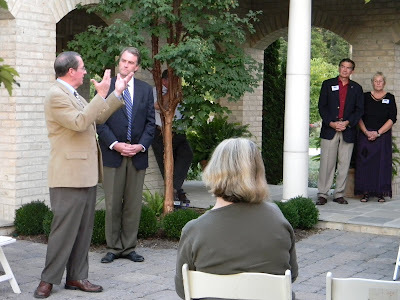 Congressman Bob Goodlatte introduces Robert Hurt at Monday night's fundraiser in Augusta County. Read about the event at the Washington Examiner: "Virginia 5th congressional district candidate Robert Hurt stumps in 6th district." 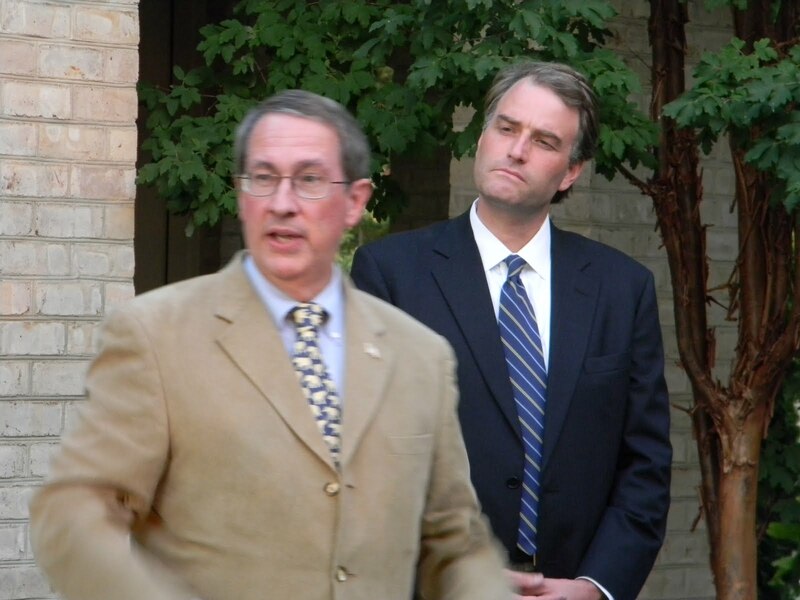 State Senators Robert Hurt and Emmett Hanger. 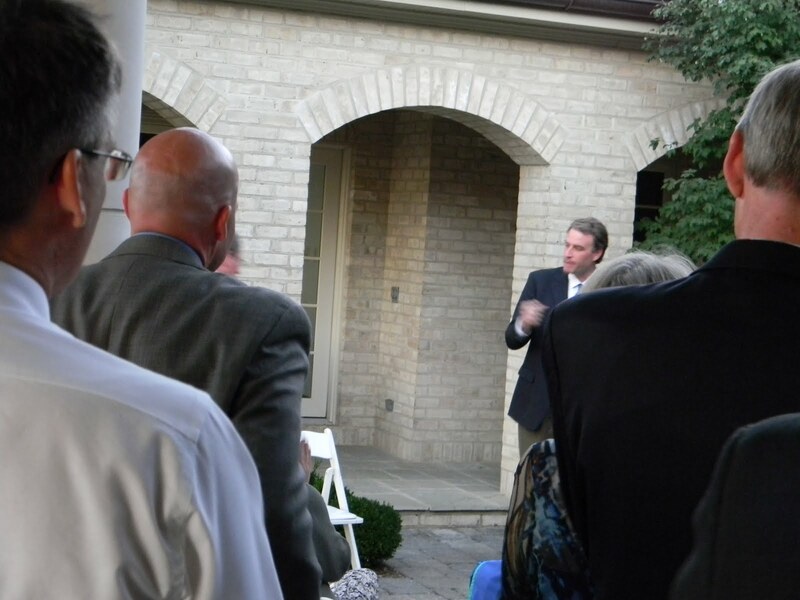 Supporters listen to Robert Hurt at the home of Tom and Peggy Sheets. Del. Todd Gilbert from Shenandoah County. 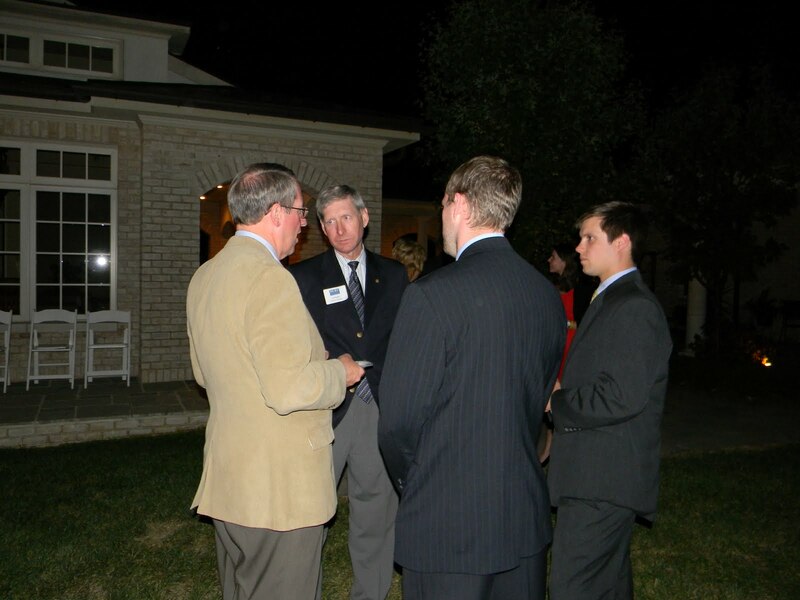 Rep. Goodlatte talks with Del. Steve Landes and others. Del. Steve Landes from Augusta County. State Sen. Emmett Hanger and his wife Sharon from Augusta County. Rep. Goodlatte presents a GOP "218" hat to Tom Sheets as Robert Hurt looks on. 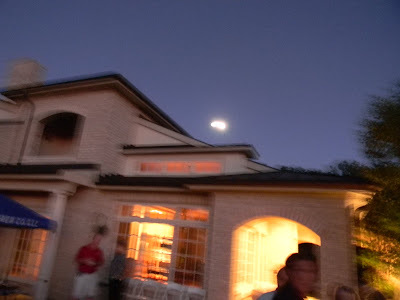 The full moon rose over the house as darkness fell. It was a perfect September evening in the Shenandoah Valley Monday as Republicans gathered for a fundraiser for Robert Hurt who is running for Congress in the neighboring 5th District against Tom Perriello (D-VA). Hosted by 6th District Congressman Bob Goodlatte at the home of Augusta County businessman Tom Sheets and his wife, Peggy, the cocktail event offered an opportunity to hear from Congressman Goodlatte as well as candidate Robert Hurt. Other electeds who attended included Sen. Emmett Hanger, Del. Steve Landes, Del. 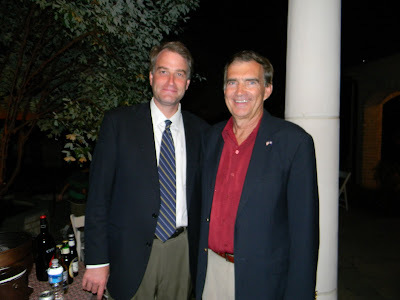 Todd Gilbert, and Del. 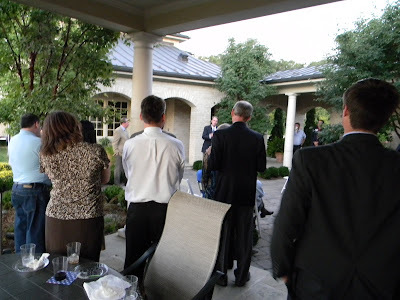 Dickie Bell as well as former Augusta Supervisor Tom Sikes and former Augusta GOP Chairman Kurt Michael and his wife, Pam, along with Sharon Hanger, Angie Landes, Anne Bell, and a number of other supporters. Augusta to spent $15 million to renovate Wilson Elementary? Monday's 3 1/2-hour Augusta County Board of Supervisors work session saw school superintendent Chuck Bishop briefing the board on a proposed expansion of Wilson Elementary School at a renovation/new construction cost of $15 million with the prospect of closing Ladd Elementary. Today's Waynesboro News-Virginian has a story by reporter Bob Stuart outlining the proposal to be presented at tonight's supervisor meeting at 7 pm at the Government Center. ... we're a little put off by the speed of the move, the size of the renovation and the uncertainties over aspects of the plan that might justify it, such as the closing of Ladd. The renovation would more than double Wilson's capacity, though it's just 17 percent over capacity now. Overall enrollment in Augusta is down, though it has increased at Wilson Elementary. It's only been 18 days at this writing since The News Virginian broke the story of renovation plans. It might well be the right move, but it merits closer consideration. The economic times are tight now and figure to grow tighter next year. Before taking a $15-million plunge, Augusta officials would do well to pause and get a closer look at the justification." Augusta County has other pricey issues on its plate including the fire department controversy at Preston Yancey in Fishersville with the recent revelation that the ISO rating was the lowest possible, a 10 on a scale of 0 (being the best) to 10 (being the worst). Homeowner premiums on local houses have gone up as a result, and citizens have expressed concern about the issue of fire safety in their neighborhoods. Augusta County also recently lost a court case concerning real estate assessments and open meetings with a ruling that the Board of Equalization had not held open public meetings as required nor kept adequate records. They improperly voted to allow an increase in Thomas and Teresa Cline's property value but, after the judge's ruling, the Clines will save $400 a year in taxes. The school issue will be brought up at tonight's meeting at 7 pm at the Government Center in Verona. The case for privatization: Should Virginia be in the booze business? Ask anyone in Virginia what they think about Gov. Bob McDonnell's idea to privatize ABC stores to get government out of the business of selling distilled spirits, and the responses are likely to be as varied as the alcoholic beverages available in those outlets. The Governor has made it clear that he does not believe government should be in the business of selling alcohol but, instead, should concentrate on the core functions of government. At his recent round of town hall meetings throughout the Commonwealth, he reiterated his belief that Virginia should shed itself of ABC stores and pour that money -- some estimates are up to $500 million -- into ever-increasing transportation needs. After being in the business for 76 years, Virginia is one of only 18 states that still control their alcoholic beverage stores. Concerns have been expressed that Virginia will become another Maryland where neon signs permeate some establishments selling beer, wine, and liquor. Beer and wine distributors have opposed the idea, fearing increased competition. Some religious groups object to what they consider to be easier access. However, privatization would not put an ABC store on every corner, as some have suggested. While there are currently 6,657 wine and beer retail outlets and 332 ABC stores, under privatization there actually may be a net reduction in the number of outlets selling alcohol because current retailers may obtain permits to add distilled spirits to their distribution of beer and wine. House Democratic leadership has announced they will not support the idea despite the fact Democratic governors Mark Warner, Tim Kaine, and Doug Wilder supported privatization. Hearing from a number of conservative bloggers in the Commonwealth, the overwhelming sense appears to be that ABC privatization is an idea whose time has arrived. Some have even questioned why conservatives, who believe in less government, would not embrace Gov. McDonnell's plan. Privatization of Virginia's ABC stores is a bipartisan idea that, as one staffer said, would have been accomplished years ago by the Democrats if it was easy. Has the time come for the government monopoly over alcohol consumption in Virginia to end? As Norm Leahy proposed, "Government has no business selling booze and ought to get out as soon as possible." Many in the Commonwealth agree. Here it is 10 pm and I haven't posted anything new on SWAC Girl because I was gone all day. Working early a.m., then met a friend early in Harrisonburg and we had lunch, then errands, then back to Staunton for a meeting, then home and on the phone ... where did the day go? 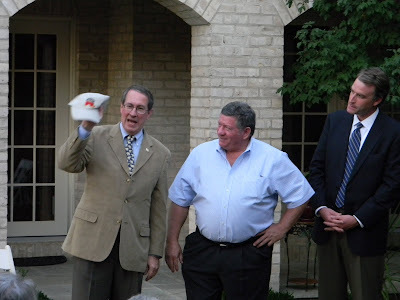 I'm working on posting photos from last night's fundraiser with Congressman Bob Goodlatte for Robert Hurt (5th District GOP Congressional candidate) at Augusta businessman Tom Sheets' home ... maybe I'll get them up tonight or it may be tomorrow morning. Back to uploading photos and research for more posts at the Washington Examiner ... nice to be a working girl! Why is Virginia in the booze business? Many questions surround Gov. Bob McDonnell's plan to privatize ABC stores. I look into some of the questions and answers with my latest post at the Washington Examiner. Last week a special U.S. Senate committee began the impeachment hearing of Judge G. Thomas Porteous, Jr., of the U.S. District Court for the Eastern District of Louisiana. As the Ranking Member of the House Task Force on Judicial Impeachment I serve as one of the lead prosecutors and have been presenting the case for Judge Porteous’s removal. Our case is based on four articles of impeachment, which charge Judge Porteous with intentionally making materially false statements and representations under penalty of perjury, engaging in a corrupt kickback scheme, soliciting and accepted unlawful gifts, and intentionally misleading the Senate during his confirmation proceedings. Specifically, the four articles of impeachment charge that while on the federal bench, Judge Porteous refused to recuse himself from a case when he had previously engaged in a corrupt kickback scheme with the attorneys representing the defense; that he later took thousands of dollars in cash from those same attorneys while the case was pending; that he took gifts from a bail bondsman in exchange for granting favorable bond rates for him and then improperly expunged the records of two of the bail bondsman’s employees, one after he was confirmed by the Senate to be a federal judge; that he lied to a bankruptcy court when he filed for bankruptcy and then violated a bankruptcy court order mandating that he not incur further debt; and that he made materially false statements to the U.S. Senate and FBI during his confirmation process. It is not a pleasant task to impeach a federal judge, yet when a judge abuses his office, it becomes necessary to take the appropriate action in order to restore the confidence of the American people in the judicial system. The Constitution gives the House of Representatives the power and responsibility to impeach federal judges and the Senate the power to remove the accused from office after a fair and impartial hearing. These are powers that Congress utilizes only in cases involving very serious allegations of misconduct. In every step along the way from the thorough investigation by the Task Force on Judicial Impeachment to the hearings held by the House Judiciary Committee and the evidentiary hearing in the Senate, we in Congress have worked in a bipartisan fashion to uncover the truth in order to root out corruption in our judicial system. Doctor's letter goes viral on Facebook: "Health care crisis ... or crisis of culture?" If you are on Facebook or an email list, you have probably already seen the photo circulating of the handsome, young emergency room doctor in green scrubs, along with his letter to the editor addressing the issue of government-mandated health care. A quick search found that Dr. R. Starner Jones is real and is a "seventh generation Mississippian and his extracurricular interests are golf, hunting, fishing and college football. 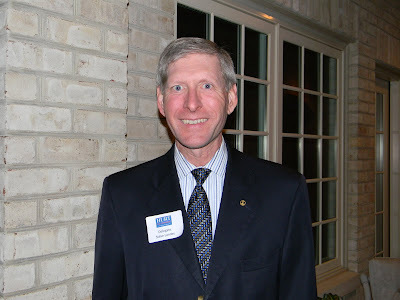 He specializes in emergency medicine at The University of Mississippi medical Center." Dr. Jones probably had no idea when he wrote that letter in August 2009 that more than a year later, in the heated debate that continues to swirl around government-mandated health care, it would go viral through emails and on Facebook. That is exactly what has happened although, as is the case with many viral forwards, the letter has been changed a bit from the original version. The original intent, however, remains the same as verified by Snopes and Truth or Fiction. As an emergency room physician, Dr. Jones makes an observation about the health care "crisis" in this country as someone who is on the front lines of health care. The letter first crossed my desk in emails circulated months ago but in the past two weeks it has seen new life as it hit the pages of Facebook with everyone from friends to a local elected official agreeing and passing it along. During my last night’s shift in the ER, I had the pleasure of evaluating a patient with a shiny new gold tooth, multiple elaborate tattoos, a very expensive brand of tennis shoes and a new cellular telephone equipped with her favorite R&B; tune for a ring tone. She smokes more than one costly pack of cigarettes every day and, somehow, still has money to buy beer. And our President expects me to pay for this woman’s health care? Our nation’s health care crisis is not a shortage of quality hospitals, doctors or nurses. It is a crisis of culture – a culture in which it is perfectly acceptable to spend money on vices while refusing to take care of one’s self or, heaven forbid, purchase health insurance. A culture that thinks I can do whatever I want to because someone else will always take care of me. While glancing over her patient chart, I happened to notice that her payer status was listed as "Medicaid"! During my examination of her, the patient informed me that she smokes more than one pack of cigarettes every day, eats only at fast-food take-outs, and somehow still has money to buy pretzels and beer. And, you and our Congress expect me to pay for this woman's health care? I contend that our nation's "health care crisis" is not the result of a shortage of quality hospitals, doctors or nurses. Rather, it is the result of a "crisis of culture" a culture in which it is perfectly acceptable to spend money on luxuries and vices while refusing to take care of one's self or, heaven forbid, purchase health insurance. It is a culture based in the irresponsible credo that "I can do whatever I want to because someone else will always take care of me". Once you fix this "culture crisis" that rewards irresponsibility and dependency, you'll be amazed at how quickly our nation's health care difficulties will disappear. It was followed by the message, "If you agree ... pass it on." America has done just that ... passed it on. However, there are those who have taken exception to Dr. Jones' thoughts including this blogger who took the time to respond but didn't take the time to look it up and realize she was responding to the revised letter, not the original. Would her thoughts have changed? Possibly not. Hers was a "feel-good" approach to what Dr. Jones sees as a real-life, practical problem. If the answer is to buy ourselves into feeling good, as indicated by the blogger, what happens when the money runs out? Just as the health care bill caused vigorous debate in this country, Dr. Jones' letter has encouraged a dialogue that continues six months after health care was passed against the wishes of the majority of the American people, and even as polls show most are still against it. Those who were against the forced health care bill may take their anger to the polls and be the cause of a shift in Congress in November. Most conservative political bloggers have dealt with the vitriol of the lefty bloggers. Anyone who has not stood at this front line of conservative defense has no idea what is out here, the aimless anger and coordinated (often paid) attacks on conservatives. Many righty blogs have had to moderate their comments sections because of the down-right nastiness that is written by the hate-filled hired hands of the radical Left. Donald Douglas has certainly received his fair share of the vitriol over at his American Power blog, and his latest post documents the most current coordinated attacks from the Left because he dared to write about 9/11 and his trip to New York City to participate in the Ground Zero Mosque protest. A heads-up: Language Warning. One Douglas supporter cautioned about responding to the Left by commenting, "Two reasons to never wrestle with a pig: 1) You get dirty. 2) The pig likes it. Never let them pull you into the cesspool, nor allow them to talk you into jumping in. Your unconquerable strength is in your ability to express the truth. They despise you for it. Let them!" Good advice ... except sometimes the pig is begging to be turned into bacon and Donald does just that with his post. Hang in there, Donald, and all other conservative bloggers who stand up for their principles and their candidates day in and day out. Harrisonburg Police say say that the floor of a third floor apartment has collapsed onto the second floor, and the second floor collapsed onto the first floor at the Hunters Ridge Apartment Complex on Port Republic Road. Rockingham Memorial Hospital says two people were flown to UVA Medical Center with serious injuries. Nearly 30 other students were treated at RMH for cuts, scrapes and bruises. Officers on the scene say several people were unconscious after the collapse. A witness on the third floor before the collapse says a certain song came on and a group of people inside the apartment complex were jumping before the floor caved in. Prayers for the injured young people. Nineteen-year-old Koby Karuzis did not intend to become a victim earlier this week when he stopped to do some sightseeing on Poor Mountain located in the Blue Ridge Mountains outside Roanoke, Virginia. As he stood near the edge to take pictures of the scenery, he said the ground beneath him crumbled and gave way. Falling down the steep mountainside and banging his head along the way, he landed at the bottom injured, disoriented, and unable to climb out of the rugged, snake-infested terrain. Cold, alone, and injured, Koby tried to figure a way out but realized he was trapped. Don Copen, who owns land near there, told ABC-13 News, "Lots of rattlesnakes. There's a trail about a half mile and then it ends and from that point on it's just rugged gorge: Brush, trees, fallen trees, fallen pines, very rocky... steep." At just under 4,000 feet altitude, Poor Mountain is the highest peak in the area with all the unexpected weather conditions that go with an isolated wilderness setting. Its name was not derived from penny-pinching inhabitants but from the poor quality of its dry, acid soil making it the location of the world's largest growth of the rare piratebush although some dispute that, saying it was named after Major Poore who served under Andrew Lewis in the French and Indian War. More than 40 rescuers were alerted about the missing man, and that was when the Blue and Gray Search and Rescue group from Harrisonburg was called in to help. A professional volunteer wilderness search and rescue organization, Blue and Gray's member Ronnie Rhodes and search dog Saibra, a four-year-old German shepherd, joined in the search along with other members. "It was really steep. We had to slide down on our rears to get to him. It was pretty hairy," Debbie Thompson with Blue and Gray Search and Rescue said. Using chainsaws, it took the rescue team more than three hours to hack a path through the undergrowth and another hour to carefully move the man almost a mile to a waiting ATV. From there it was another mile trip down a bumpy old logging road to an awaiting ambulance. Blue and Gray's training director Kathleen Connor was happy with the outcome on Poor Mountain but added, "I've been doing this for about 15 years, and I have yet to find anyone alive." Koby recalled the experience and a long, cold night alone, grateful to be home and grateful for the rescue team. In the rugged mountains that flank the Shenandoah Valley, rescue teams such as the Blue and Gray are essential when hikers go missing. Their professionalism and dedication are evident from hours spent in this volunteer capacity, training their dogs and themselves, preparing for life-and-death situations, providing their own equipment and transportation, and their willingness to be there no matter the outcome. This time it had a good ending. Read the rest at the Washington Examiner. This morning the smoke has died down after volunteer firefighters spent all night working a six-alarm fire that had everyone on alert. Old tires and a trailer burned throughout the night and continue to smolder today. A bulldozer could be heard late into the night as a fire line was cleared between the fire and surround trees and underbrush. Today a chain saw can be heard as work continues. Winds are calm at the moment but our proximity to the Appalachian Mountains means winds could pick up at anytime. 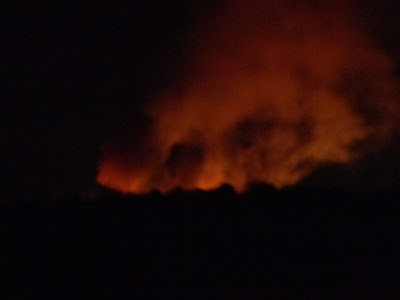 Last night was a different story when flames shot up above the trees on the ridge behind the house, and a series of small explosions could be heard as fire engulfed something up on that ridge. Neighbors gathered to watch as a parade of cars pulled over to observe, those who could see the black smoke from miles away. Extremely dry conditions had everyone concerned that the fire would get into the trees and race toward homes. Firefighters and emergency personnel were on the scene at midnight when this photo was taken by SWAC Daughter as the two of us drove by the scene. Friends were among the volunteers fighting the blaze and we're thankful to them for their service and dedication. 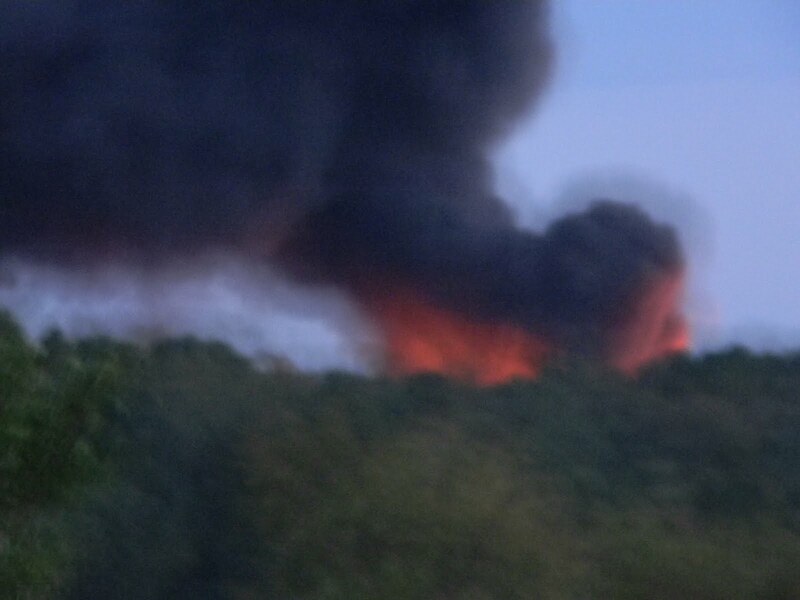 Black smoke billowed as dusk settled on the fire that began around 6:30 Thursday evening. 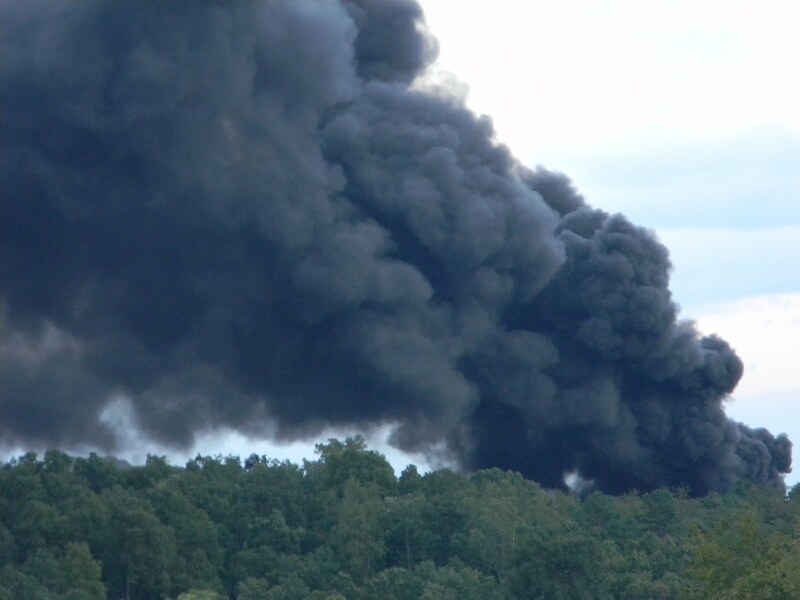 This morning SWAC Daughter called from the northern end of Augusta County to say the smoke was still lingering in the air as well as the smell of burning tires. We were extremely fortunate that winds were south-southwest last night because that kept the smoke off out house located within 1/4 mile of the flames. The smoke was so noticeable that a firefighter texted his wife, "Look toward Lynn's." Again, thanks to all the volunteers, many who spent the entire night on location to be sure this fire didn't get out of control. Many prayers went up last night for their safety. 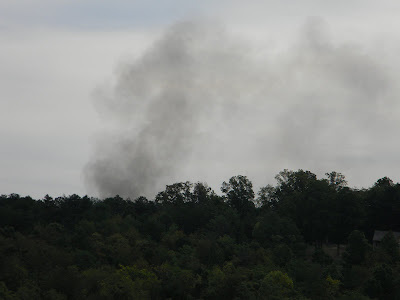 Smoke began billowing around 6:30 p.m. Thursday on the ridge behind our house. 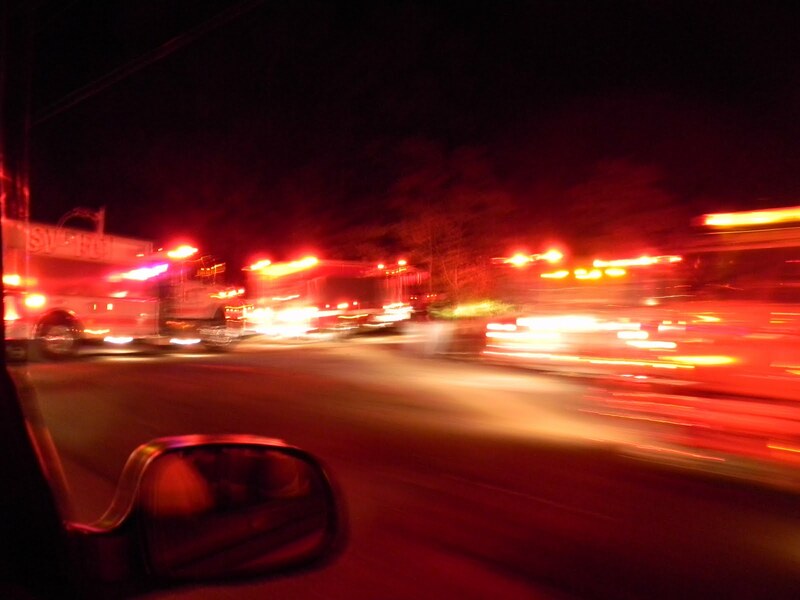 By 6:45 or so the first sirens could be heard as firefighters began arriving from various departments. This was the smoke behind our house. The fire was about an eight of a mile south of this view. 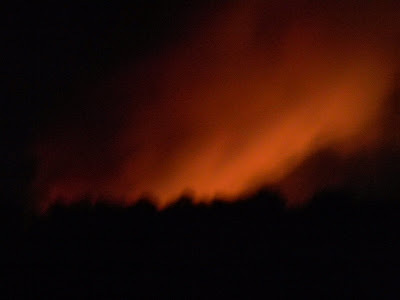 As darkness fell the flames could be seen leaping above the treetops. It's dark and the fire is still roaring on the ridge behind the house. It's been a regular freeway through here as folks who could see the fire from miles away have driven out to park along the road and watch. 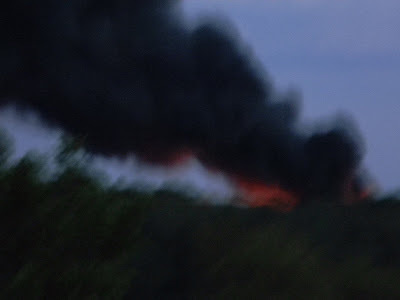 We sat with neighbors until after dark watching the fire trucks arriving, the traffic, the black smoke billowing, and the flames leaping higher than the treetops. Prayers for the safety of the firefighters who are working the fire even as I type. Which departments responded? We heard many trucks and many sirens. Rick Boucher: "Baby, you can drive my (new) car"
I'm not familiar with everything candidates buy with their campaign money. However, it seems buying a new $29,000 car would not fall in the ethical column even if not in the illegal column of dos and don'ts of campaign practices. Rick Boucher (D-VA) is reportedly the owner of a brand new Ford Edge. Wonder what supporters who are driving 10-year-old vehicles think? Perhaps many (most?) of those supporters do not make anywhere near Boucher's $175,000 annual salary. More from Ben Tribbet and Moe Lane. Democratic blogger Ben wrote, "If you didn't understand the populist revolt going on against Washington this year before -- you should now." ... something from Michele Bachman, something from Sharon Angle, something from Del. Dickie Bell, an informational card from a fellow State Central Committee member, and a request for more money from the Heritage Foundation (which we already belong to). Which reminds me ... there's an Augusta County political fund raiser Monday, Sept. 20, for Robert Hurt running for the Republican nomination in the 5th District (just over the mountain). Donation is $50 per person for a reception with Congressman Bob Goodlatte (R-VA) for those who would like to donate to the Hurt campaign. Email for more information. What?! Poverty is UP on Barack Obama's watch? 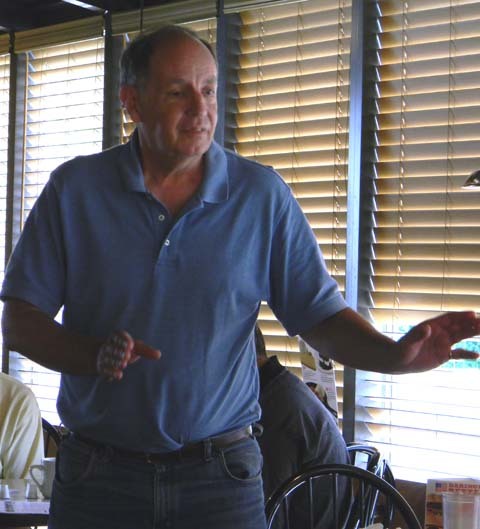 Does tea party need to better vet its candidates? Vetting of political candidates ... want to learn about it before a candidate is chosen or after the media get hold of it? Ace of Spades has a post today that offers insight into this issue as he explains why he's down on out-of-nowhere candidates. In the heart of the Shenandoah Valley of Virginia is the Frontier Culture Museum of Virginia, an outdoor, living-history, hands-on historic experience for young and old alike. The museum, through period-costumed interpreters, presents the story of the people who settled in the Shenandoah Valley, beginning with recreated farms from Ireland, Germany, and England. The journey continues with their migration to America represented by the American farms and school house. This weekend another part of that story will unfold as the Western African Farm is dedicated. After much research and a year spent building an Igbo farm village, a grand ceremony will take place on Saturday, September 18, when the museum will be open free of charge to the public to attend the West African farm dedication and explore all the farms. The Igbo (pronounced "Eee-boo") represent 300,000 African captives brought to the colonies between 1700-1775 with the overwhelming majority originally from West and West Central Africa, now known as the nation of Nigeria. Virginia, with its large tobacco farms and agriculture base, imported many slaves to work as craftsmen, artisans, farm field hands and domestic servants. The Igbo were highly successful in Africa as they adapted farming techniques suitable to the rain forest environment. Yams were a main food source, planted in fields cleared and burned from the surrounding rain forest and, as yam yields increased, so did a man's standing in the community. The Igbo were also successful in finding uses for local trees, especially palms, for food and materials. Their skills extended to metal-working, wood-carving, basket-making, pottery, and textiles, and they were experienced traders. The addition of the new farm is an example of an Igbo compound in the 1700s made up of buildings to house a man, his wives (usually two or three), his children, and dependents. The size of his compound was a measure of his success. When approaching the West African Farm at the Frontier Culture Museum, one of the first things visitors will see are non-native banana and palm trees outside the red mud wall of the compound. Inside are several structures with clay walls and raffia palm thatch roofs, all built from local and imported materials. The central structure within is the man's day house called an obi, with buildings for the man's residence and his wives located behind the obi. Saturday will be a celebration at the Frontier Culture Museum as Igbo from throughout the United States and the world converge on Staunton to participate in the ceremony. The dedication begins at 11:00 a.m. but observers may want to arrive a little earlier to try and get a good vantage point because of the number of spectators who are expected. The Governor of Nigeria will be in attendance as well as many other dignitaries. Are Dems hoping it will be a game changer? It's a bird. It's a plane. It's a ... target? Democratic National Committee chairman and former Virginia governor Tim Kaine was a guest on Fox & Friends Wednesday morning as he unveiled the new Democratic Party logo. Something looked odd about the logo, I thought, but couldn't quite put my finger on it ... until I spied Washington Examiner's Associate Commentary Editor J.P. Freire's hilarious commentary that had me laughing until tears streamed down my face. I read the title ... "Democrats unveil new logo: 'It's a target.' " That was it! The dang thing looked like a target! What does that say about Democrats? They are making targets of themselves? They feel like they've been targeted for D-feat in November? J.P. jokingly suggested, "Looks like the Democrats just gave themselves a 'D.' Which some may feel is generous." Commenters were having a hayday with it, too, with one suggesting, " 'Change that Matters'? You mean CHANGE THE SUBJECT?" I guess Dems are hoping it will be a game changer. Sharia law and the U.S. So tea party favorite Christine O'Donnell won the Delaware Republican primary over Republican Mike Castle. Some thoughts at the Washington Examiner about the November races, the "establishment," and what it all may mean: Christine O'Donnell wins Delaware ... now what? Governor Bob McDonnell announced today that August revenue collections increased by 5.3% over the prior year. This is the fifth month out of the last six in which state revenue collections exceeded the previous year’s amount. The revenue increase was primarily driven by withholding and sales tax collections, a very good sign for the state. The two revenue sources, which are most closely linked to current economic activity in the Commonwealth, extended their string of consecutive monthly increases to four and five months. However, adjusted for the accelerated sales tax program, total state revenues grew 3.3 percent through August, lagging the economic-base forecast of 4.2 percent growth. September collections will complete the first quarter of the fiscal year and will be critical in assessing current trends and the most likely path for total general fund revenues. Speaking about the latest revenue report, Governor McDonnell noted, “The increase in revenue collections this August is a small, but positive, sign for Virginia’s economy especially in light of the performance of withholding receipts, the largest source of revenue for the general fund. Complete 14-part series on the VAST Rocket Boys can be found here. That's the mindset of some in western Augusta County even if the backyard consists of hundreds of acres of land. They just don't want the Valley AeroSpace Club to participate in rocket launches for reasons that have been shot down by many who also live in the area. 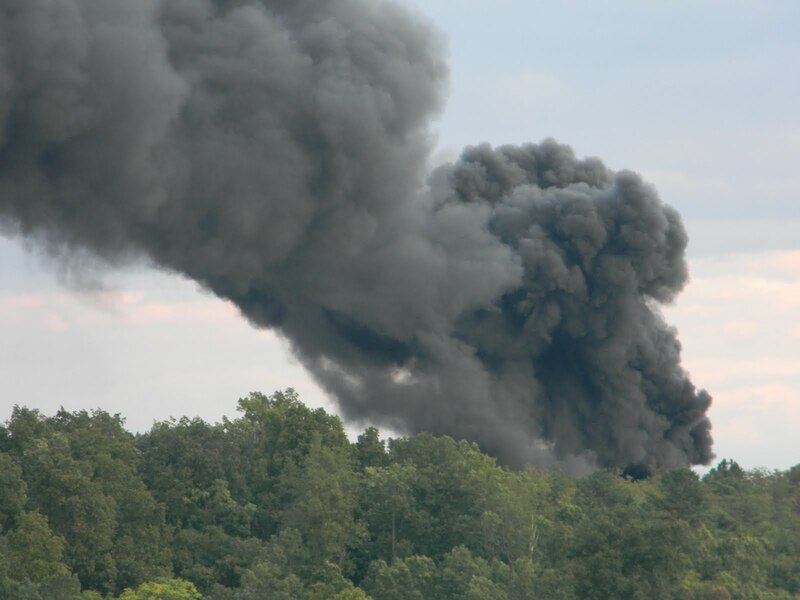 The trouble began in July 2009 when Augusta County notified land owner Bill Croft that a Special Use Permit (SUP) was necessary to continue model rocket launches on his 500-acre property in Swoope. A September Board of Zoning Appeals hearing denied the SUP leading to an appeal by the rocketry club. VAST's president Chuck Neff has kept an updated legal time line at the VAST website. Ten people spoke against the permit in September and Jeanne Hoffman, who lives near the launches, presented a petition of 100 names. Informed of the team’s appeal, Hoffman said she still feels their activities are not compatible to the agricultural area. “I think it’s a great thing, but this is not the place to do it,” she said. If not on 500 acres of land in the middle of a sparsely-populated area, then where? In this rural area there is a need for activities for young people who often say they have nothing to do. "Cruisers" are discouraged from congregating in parking lots. Meth and drugs and gang related activities present concerns for law enforcement authorities as well as drunken parties with stabbings like the one reported by the Waynesboro News Virginian earlier this year. The latest from yesterday's hearing can be read at the News Virginian, all the background can be read in a 14-part SWAC Girl series, and the legal time line kept by Chuck Neff can be found at the VAST website. On online petition is available to support the VAST Rocket Boys. 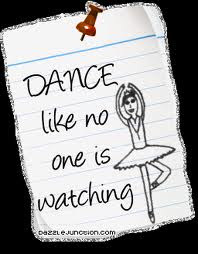 Anyone familiar with the movie, "Dirty Dancing," recognizes that line ... and Patrick Swayze helped make that movie what it was. He danced, he sang, he acted ... the man was a entertainment machine, and "Dirty Dancing" remains one of my favorite movies. Sadly, today Patrick Swayze lost his battle with the pancreatic cancer he had fought since early 2008. His talent will be missed ... but he will live on in his movies and songs. Prayers to his wife and family at this sad time. The white liberal’s agenda, coupled with that of black race hustlers, has had and continues to have a devastating impact on ordinary black people. Perhaps the most debilitating aspect of this liberal malevolence is in the area of education. Recently, I spoke with a Midwestern university engineering professor who was trying to help an inner-city black student who was admitted to the university’s electrical engineering program. The student was sure that he was well prepared for an engineering curriculum; his high school had convinced him of that and the university recruiters supported that notion. His poor performance on the university’s math placement exam required that he take remedial math courses. He’s failed them and is now on academic probation after two semesters of earning less than a 2.0 grade point average. One of the powerful writers in the national blogosphere, Dr. Donald Douglas, has photos and commentary at his American Power blog commemorating yesterday, September 11, 2010, as he walked the streets, saw the sights, heard those who lost loved ones, photographed those who love America ... and those who are now known as the "9/11 Truthers." 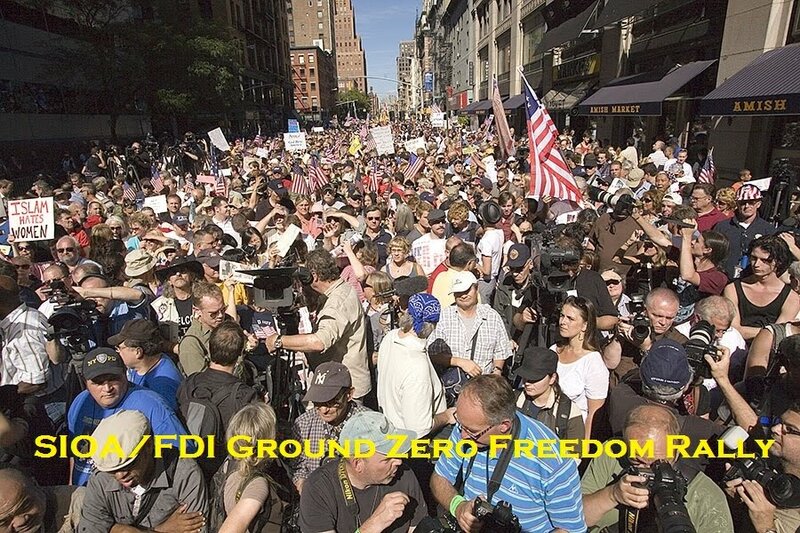 Flying from California to New York, Donald attended the Ground Zero Mosque rally to protest the building of a Muslim mosque so close to Ground Zero along with 40,000 other people, as documented by Pamela Geller at Atlas Shrugs with tremendous photos by El Marco. Check it out for the news the news doesn't cover. 9/11 ... where were you that day? My parents' generation remembered where they were when they heard about the Japanese attack on Pearl Harbor that drew America into World War II. I often ask people where they were when they heard about 9/11 and this week I posed the question on Facebook. I thank them for sharing. My first political mentor Pat Haley, former chairman of the Staunton Republican Committee and member of the Jim Gilmore administration: "I was sitting in a meeting with Governor Gilmore in Richmond when the first plane hit. The first report stated it was a small plane and probably an accident. When the second plane hit and then the Pentagon, Governor Gilmore sprang into action and took control of the Virginia forces. We were told that planes were over the Atlantic Ocean heading toward New York, Washington, and the Fed Bank in Richmond. I saw leadership in action!" Keith Drake, former chairman of the Albermarle Republican Committee: "In a meeting in downtown Boston. It was very surreal." Pam Michael, political ally and wife of former chairman of Augusta County Republican Committee Kurt Michael: "At home with the children and got a call from Kurt at school with the shocking news." Luis Padilla, proud American originally from Honduras: I will never forget what happened 9 years ago. I was living in Lansdale, Pennsylvania when muslim extremists killed many innocent people. I have friends who lost love ones that day. And for the first time I did not feel save in this country. Thank God that we had a president who defended us regardless if some people support his actions or not. This day will be in our history and pray to God that never happen again. SallyAnn Gowen, Staunton resident: " 'Driving down some cold interstate.'" My husband called me on my cell phone and I remember that my first thought was 'why's it such a big deal that a plane hit a building?' "
Pam Richmond, Augusta County resident: "Teaching a high school math class (Geometry). Because we were within about 4 miles of the Pentagon, we were put on lock-down. My classroom had a TV, so we watched, horrified, mesmerized. The next day, a boy laughed, said we deserved what we got. I knew I'd never be able to treat him fairly again, so I had him transferred to another teacher's Geometry class." Deb Kirtland, Augusta County resident and fellow home school mom: "Driving my son to piano lessons. It was shocking news and took a while to really sink in. We didn't get much school work done that day!" 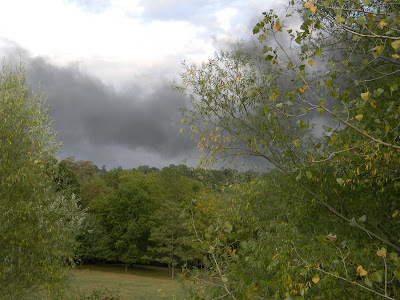 Janice Berkey Bence, Augusta County resident and fellow home school mom: "In my car driving to Harrisonburg thinking what pretty day it was ... before I heard the news." Cindy Parr Potts, high school classmate who now lives in Kentucky: "I was teaching 8th grade Math and in the classroom. My husband called me and told me to turn on the tv, I did just in time to see the second plane hit." Debbie Campbell Fayman, Chesterfield County resident and fellow high school classmate: "I was working in a client's home that morning. I had heard something on the car radio about a plane crash so when I arrived at the house I turned on the TV. The client and I watched together as the events unfolded. It was surreal. The client's daughter lived in Manhattan at the time. He was terrified for her safety. I don't think I got any work done that day." Ron, fellow blogger: "We were on our way home from a vacation in Maine. That morning, we were in a hotel in New Jersey (having passed New York the day before) and saw on TV one of the WTC towers on fire because a plane had hit it. I was wondering what kind of an idiot would fly a plane into the building. Then we saw the second plane hit. Let's just say that driving past Philadelphia, Wilmington, and Baltimore was interesting that day. To think, I almost took a job on the 73rd floor of the North Tower! "On our way home September 11, we had to stop for lunch (as our older son was 10 1/2 months old at the time) near Baltimore. Given the events of the day, I did not want to travel through ...the downtown tunnels and opted to go around the north side of the Baltimore Beltway. We stopped for lunch at a stereotypical Baltimore diner (the "Bel-Loc," I think) on Loch Raven Boulevard. The place looked like it was frozen in time from the early 1960s, except for the menu prices. A man who was obviously a regular patron came into the diner a few minutes after we did, and the servers were asking him why he wasn't having an operation that day. He was telling them that his operation was postponed because the hospital was anticipating having a crush of victims to treat that day (which didn't end up happening). "We made it home (in Maryland, where we lived at the time) in the early afternoon, and our families were crazy with worry about us. We hadn't called because we did not have a cell phone with us. "I might add that at the time, I worked in Crystal City and went to work on September 12. As I took the Metro Yellow Line over the Potomac River, I saw that everyone on the train just went silent and was looking at the (still burning) Pentagon with sadness and reverence. A lot of smoke drifted down to Crystal City and the place smelled like death. "Later on I found out that a guy I knew in high school was on the plane that hit the Pentagon, and the son of a candidate I had supported many years before (and who had also gone to my high school) had worked for Cantor Fitzgerald and was killed in the destruction of the WTC South Tower." Arthur Goggin, fellow high school classmate: "I was in Phoenix, Arizona, getting ready to hike the Grand Canyon rim to rim. A daunting day in our lives." Dee Hubbard Simon, fellow high school classmate and resident of North Carolina: "I lived in Princeton, NJ, near NY City. My husband worked on Park Ave and son worked in midtown in NY City. I heard about the 1st plane and called my husband at work. He hadn't heard a thing. Then I saw the 2nd plane hit the tower & knew immediately it was a terrorist attack. Lee, my twin sister called me & said the towers are leaning. I said NO WAY! But, she was right. DOWN they came. Very shocking. All the phones were down for hrs. Finally got an email that they were fine, but couldn't get off the island for a day or so. Mike said NY City the next day looked like a ghost town. He arrived home to heavily armed guards at the train station. Some of the people in our community never returned home. One of them was Todd Beamer (Let's Roll!). Their cars sat parked at the train station for days, weeks, decorated in flowers and sympathy notes. The community was in shock, very somber for a week or so. I could smell the burning buildings for weeks afterwards. "My son's path train out of Jersey City was one that was buried under the rubble. Luckily he had gone to work earlier. My husband couldn't go to work for a week. A bomb threat was called in hourly on the building where he worked. Things were ...crazy! The sadness was overwhelming. Not too long after that our post office was the first one to discover Anthrax. A postal worker died. We stood over big trash cans outside with face mask and rubber gloves opening our irradiated mail. Have I mentioned how much I LOVE living in North Carolina now?" Sheri Smith, Augusta County resident and fellow home school mom: "Just starting homeschool when we saw the news flash by on TV. Will never forget the beautiful bright blue sky outside our window that day as we watched in disbelief the devastation happening at THAT moment in our country." Bob Kirchman, Augusta County resident, fellow home school dad, and fellow blogger: "I'd worked in the studio that morning. I noticed how beautiful the day was and decided to take a run later in the morning. I remember looking up at the blue sky, even thinking it would be a nice day to be up in a plane. A jet sailed high above me. It was one of those crisp September days you don't want to come inside from. When I came back from my run I learned that a plane had hit the first tower. Then we learned that the second plane had hit. The Pentagon had been hit too. Flight 93 bored into a field in Pennsylvania. We were being attacked with our own airplanes. It was time to pray. For the next few days the absence of airplanes was very noticeable." Jeanine Martin, NoVa resident and fellow blogger: "I was home alone, one son had just begun his first year at UVA, one son in high school, and husband was on a business trip to Colorado Springs. I had no radio or television turned on. I knew nothing. Then my best friend called and told me to turn on the television, just in time to see the second plane slam into the second tower. The rest of the day, I spent on the computer and talking to friends while trying to get through to my husband and older son. It was so scary to be so close to DC and listen to planes patrolling the air. The whole day, week, month, year, was so frightening. I just wanted my family together, all in one place, all in one piece. My son came home from UVA on Friday and my husband was finally able to get a plane home on Saturday. He flew in to Dulles but his car, our family van, was stuck in a parking lot at Reagan National. It was closed and remained closed. So many bad memories. So much mourning for the loss of so many Americans in such a brutal way and mourning for the loss of my generation's innocence. We never thought something like that could happen in America! I kept thinking, this must be how my parents and grandparents felt on December 7, 1941. Fonda C. Gardner, Staunton resident and fellow home school mom: "I was in the kitchen talking on the phone with my Aunt. She told me to turn on the TV because something horrible was happening! Saw the second building hit and watched both fall. I was homeschooling and Seth's friend Brian came over. We all sat in front of the TV watching one of the most horrible days in our history as a Nation. And now they want to make a mockery of that area." Danny Allen, Staunton resident: "Myrtle Beach on vacation. Ended up with little shopping, and ordered room service- glued to the TV." Beth Burgener Jenkins, Augusta County resident and fellow home school mom: "Teaching Preschool that morning -- wondering why all the parents were coming in and grabbing up their preschoolers because of a plane crash -- Little did we know at the time!!!! I'm sure they were thankful that they could hold them and that they were safe and sound! Sadness still seeps into my heart for the families who lost loved ones - not only with the devastation of the plane crash but with the rescue efforts after!!! HATE is such an evil thing!" Juanita Ballenger, NoVa resident and fellow RPV Central Committee member: "I remember particularly in DC, where I was working. I remember the man waving the American Flag on the 14th Street Bridge and driving by the Pentagon as it was still burning." 9/11/01: "... we saw the best of our nation"
Heroes of Flight 93 ... "Let's Roll"
9/11 ... fly the American flag! "Never forget ... never give in"
9/11 Week ... "Never forget"
Could Democrats lose it all in November? Shenandoah ... "daughter of the stars"